The Pearl of Dorset with its stunning scenery and views; part of the World Heritage Jurassic Coastline; a famous seaside resort with the highly acclaimed Cobb and exciting fossil forays. Such are the enticements of this wonderful part of the English coast. But Lyme Regis has a history that many of its visitors may be unaware and which adds to the uniquely inspiring inheritance this popular holiday destination has acquired. The bulky black cannons on the Cobb give a clue to the very important role the seaside town has played during England’s history. Situated at the mouth of the River Lyme and more or less equally positioned between Dorchester and Exeter, Lyme Regis is the most westerly Dorset town. The first historic recording of Lyme is in 774 when the West Saxon King Cynewulf granted Sherborne Abbey certain rights and with the Abbey’s high demand for salt, the monks distilled salt from the sea water. It was also distinguished from its neighbour Uplyme with the name Netherlyme-supra-mare. It is later mentioned in the Domesday Book of 1086. By the time the Regis was added by Edward I in 1284 and Lyme Regis became a free borough, it was already of great importance to the English economy and was listed as a port in 1234. The construction of the Cobb undoubtedly helped to further increase the town’s importance, the first recorded mention of which is in 1328 when it was damaged by storms. There were several other occasions throughout the centuries when the Cobb was damaged; in 1377 it was completely destroyed along with 50 boats and 80 houses. But even though Lyme Regis was of great value to the King and country, it was eventually to become a thorn in the Royal side. Following the failed assassination attempt by Guy Fawkes in 1605, the religious unrest continued unabated until things really started hotting up in 1641 when the Catholics of Ireland killed many hundreds of Protestants. Panic ensued and Charles I was unable to reach any agreement with Parliament resulting in a division of allegiance and civil war breaking out in 1642 between the Royalists and the Parliamentarians. By September 1643 the Royalists virtually dominated the west excluding Plymouth, Poole and Lyme. Lyme was strategically very important to the Royalists; its control would mean a geographical line of control from Bristol to the English Channel. Lyme was therefore equally important to the Parliamentarians. Two local lords who had previously represented Lyme in Parliament along with a relative unknown, Somerset born Robert Blake, now became leaders in the preparation to repel the enemy. Sir Thomas Trenchard and Sir Walter Earle organised Lyme’s land defences. There were no town walls, so turf blockhouses were constructed and connected with earthworks and trenches and towers, they also managed to persuade Parliament to supply more money and extra men. Robert Blake who had proved himself at Bristol was in charge of sea defences and despite his age (43 years old was considered quite old then!) and lack of military background, his defence strategy proved to be invaluable. In March 1644 King Charles instructed Prince Maurice to give up his siege of Plymouth and siege Lyme instead. En route, Beaminster fell to the Royalists and amongst the Royalist leaders were Sir Ralph Hopton and Lord Poulett and they expected the battle for Lyme to be over by breakfast! By April, Maurice’s troops were camped at Uplyme and on the neighbouring hills, other soldiers were billeted at Haye House and Colway Manor. Maurice’s method of attack was an arc of soldiers; the Irish to the east; Cornish to the north and Devon troops to the west. But they had underestimated the strength of determination of the Lyme townsfolk who whilst only totalling around 500 men, were loyal to the Parliamentarian cause. The town also managed to receive fresh food supplies via the port, the cliffs being too steep for an effective artillery attack from the Royalist soldiers. Parliament organised a regular flotilla, most of which managed to reach the Cobb in safety. There are reports that the women dressed as men to make the opposing side think the Lyme defenders had greater numbers. The women have been described as Amazonian; not only did they help maintain the ammunition supply and dig ditches, but they also fought alongside the men. The Royalist successes were minor such as when a boy from the enemy camp managed to steal the town colours and when the Cobb was set alight along with many of the ships that were moored. The enemy’s fire arrows was one of the main problems for the Lyme townspeople so they solved this problem by pulling the thatch from their rooves. Six weeks into the siege, Lyme Regis received further support from Warwick, the high admiral who managed to deliver supplies. It was around 8 May that the Royalists made another attempt to defeat the town, but they suffered heavy casualties and the Buddle River apparently “ran red”. It would also appear that poor old Maurice was suffering from a bout of influenza and was not able to directly oversee what was going on in the skirmish. Combined with the fact that most of the Royalist army were either press ganged or foreign mercenaries, the siege was doomed to failure. After several attempts to storm the town as well as setting it alight combined with the news that the Parliamentarian Earl of Essex was making his way over to help Lyme, Prince Maurice withdrew his army on 14 June with the loss of not only his reputation but also over 2,000 men compared with Lyme’s losses of around 120. The town was garrisoned for a further three years with the occasional flurry of fighting but by July 1647 the troops were disbanded and the earthworks removed. In August 1648 Parliament supplied over 2,000 oaks to repair the damaged town. 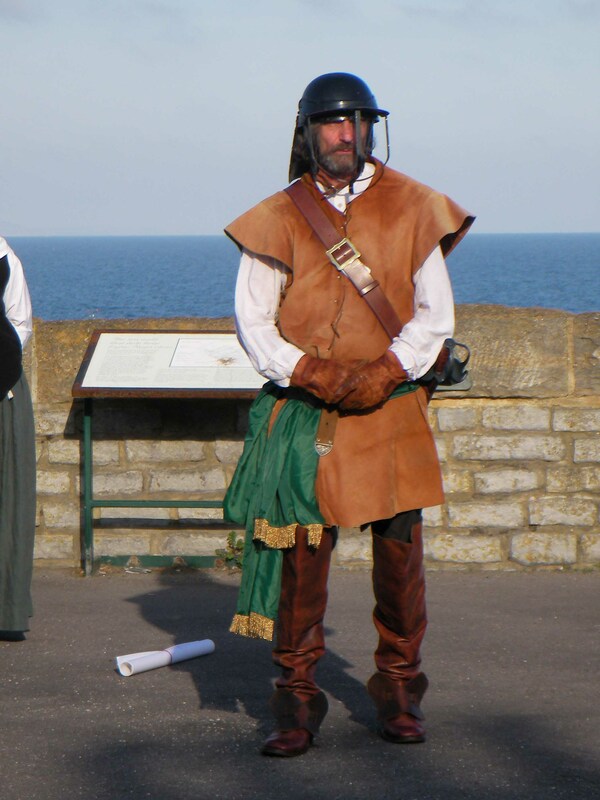 Whilst there is very little evidence remaining of the siege of Lyme Regis, a small band of people gather each year on 16 June to celebrate Lyme’s deliverance from the Royalists, although there are said to be some restless spirits of three Royalist soldiers who appear on occasion in the Volunteer Inn, perhaps looking for any fleeing Parliamentarians, so best not to talk politics, just in case. This entry was posted in Historical Events and tagged English civil war, Guy Fawkes, King Charles, Lyme Regis, Parliamentarian, Royalist. Bookmark the permalink.